Back in the old days when there was still magic in the world, the fairy folk used to improve their diminishing bloodline by exchanging their offspring with human children. 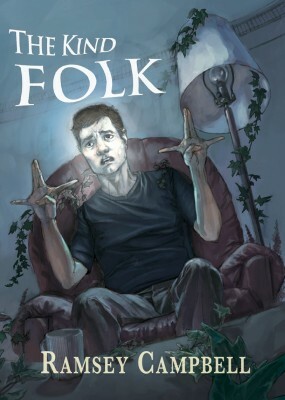 In The Kind Folk (2012), the fairies are corrupt shadows of their mythological selves, but the practice of changelings continues. When a DNA test shows his biological parents aren’t somehow his, Luke is understandably mystified. Luke’s uncle, Terry, who was strangely attached to Luke, may know something, but dies before divulging any facts. However, in Terry’s house Luke discovers a semi-incoherent diary tracking the uncle’s travels throughout Britain, as well as a carving of a strange, barely human face. Suddenly Luke, an up-and-coming comedian known for his skilful mimicry, starts to get gigs around Britain, in places that happen to correspond with the diary. And soon there are strange folk appearing at his shows, always standing in the back, twisting their hands in unnatural positions, as if signalling some secret sign. They seem to want something, and as it happens, Luke’s girlfriend Sophie is pregnant. The Kind Folk is Campbell at his very best; it’s built on a solid mythological foundation that’s familiar enough to feel real. The silent, elongated shadows are classic Campbell, creatures that always appear in the distance, half-glimpsed, so that they could be just ordinary youths loitering around – at least until they scurry away on all four limbs or some other craziness. There’s also the humour, as usual, striking a perfect balance with the horror; almost every sentence feels like a wound-up jack-in-the-box, ready to be sprung on the reader with a twist that might turn everything that came before it on its head. The relatively short length of the novel is just right; the narrative is rich, but nothing is overextended. Every chapter is in its right place. And as Luke’s journey progresses, the atmosphere goes up a notch or two. The dark city streets, the ruins of abandoned houses, the lonely places of the world where something old still lingers – the night is deep and dark and full of scares, but there’s also a lot of beauty in these shadowy, almost wistful passages. The novel ends with a perfect note of awe and wonder, as another generation steps forward. The fairies might’ve retreated back into the shadows, but with books like The Kind Folk, there’s still plenty of magic left in the world. 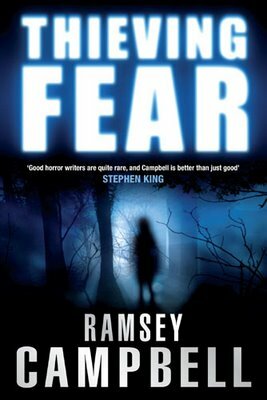 A dead occultist makes life complicated for four cousins in Thieving Fear, a 2008 novel by Ramsey Campbell. Like Campbell’s The Grin of the Dark (2006), Thieving Fear also features characters who have their perception of reality severely impaired by a supernatural force. The story starts with Charlotte, Ellen, Hugh and Rory camping as youngsters at a site they later learn was the location of a house owned by a notorious magician. During the night they have nightmares and Charlotte almost walks off a cliff. Years later, the four begin exhibiting strange symptoms, alternately ridiculous and horrific, in true Campbell style; Hugh loses his sense of direction, Charlotte gets claustrophobic, Rory loses his vision and Ellen begins to think she’s disgustingly fat. Also, a thin shadow of a man always seems to lurk somewhere near. Ultimately they trace the events back to that one night in their youth, and discover the dark secrets buried inside the cliff. It’s all about the characters in this one, their experiences as their senses fail and their reality unravels in everyday situations. The downside is that the plot becomes secondary; there isn’t much of a one, and even the adversary is handled as little more than a flitting shadow. As a result Thieving Fear doesn’t quite have the impact of its immediate predecessor; The Grin of the Dark had the mystery of silent film comedian Tubby Thackeray going for it, giving the readers some good, firm plot to grab onto. The subplots about Ellen’s position at a care home and Hugh’s job at a supermarket are tickly good fun, with some wickedly unpleasant supporting characters. Ellen’s foray into the publishing world with Charlotte as her editor also makes for a fun read, with anecdotes that are possibly drawn from experience. Campbell’s sharp writing keeps things interesting, but the going does get quite frustrating in the middle, with all the characters suffering from some impediment or other. The end, however, rewards the reader with a nice, weird twist and great imagery. As a whole Thieving Fear is a low key affair, but it does deliver where it counts.